Right, firstly updating the blog at this time means for certain I’m going to have a late night and that late night has only been made later by the shear idiocy of First Great Western. But I’m determined not to bore you, consistent reader, any more than I normally do with moans about this and instead announce that I have an amendment to make………. You will have seen from my post on the Electricity Company that I was slightly disappointed by my visit to the Masons Arms in Battersea. Well let no man accuse the Masons or Fullers of not making amends! I was contacted this week firstly by Fullers in that they wanted the General Manager of the Masons to speak to me personally which was then followed by a lovely phone call from Matt (the General Manager) who not only apologised for my disappointment during my visit, making me feel very guilty in the process(!) but also sent me a very generous voucher to come and have a meal and a pint on them at my convenience. He also assured me that the Cask Marque certificate is now proudly on display so I more than look forward to revisiting and making their acquaintance again. I will of course Blog this re-visit when it happens. First Great Western, take note, this is how you perform customer service. Listen to them, understand them and then act on those comments………….oh sorry of course I forgot, you hate your customers in the first place. Right, so down to tonight’s visit……………….. It says "Northumberland Avenue" - Honest it does! 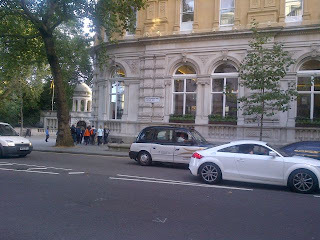 Regular readers of the blog will know that Northumberland Avenue nearly got lumped in with last week’s visit to Whitehall. It’s when you see how close the streets are you realise that the Monopoly board designers perhaps had some method behind their madness. Northumberland Street is a swift left turn when exiting from Embankment Tube station and it was only a brisk walk up the street to the turning to the aptly named Northumberland Street and the Sherlock Holmes pub. I had been in the Sherlock Holmes before as our work’s Xmas party was held just round the corner and a swift pre-party pint was the order of the evening. That evening we were all dressed in penguin suits which drew a couple of witty remarks from the other customers so it was something nearing relief that tonight we were in mufti. What we’d also failed to note the last time we were here is the interesting history of the pub. Their own website tells the full story (and much better than I do) but special mention must be made of the display of Sherlock Holmes’s sitting room and the rest of the Holmensian memorabilia. Unfortunately we didn’t get to see the sitting room as the pub was absolutely rammed, full to the gunnels, and as we were running at our largest crowd so far it was rather a case of getting in, getting a drink, getting the scan and getting out again. We did note the rather impressive encased dog’s head on the wall (presumably signifying the Hound of the Baskervilles) but we also noted the impressive framed casing around the Cask Marque certificate located behind the bar. Luckily Aussie Pete’s antipodean charm got the barmaid to rescue the certificate from the frame so that we could all scan it. I say “all” because now we’ve got Aussie Pete, New Guy Mickey, Buddie Rob, Spiky haired Ed and Charlie all scanning along with me. I should have charged commission! As previously mentioned this was our largest visitation so far as along with these 5 regulars we were joined tonight by “yet to be given a nickname Michael” and the lovely Mags. Is there nothing more attractive than a woman with a pint? 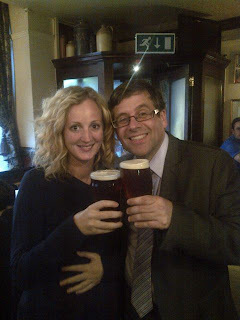 Yes, an overweight bespectacled middle aged bloke with a pint. Because the place was so full we all elected that a swift move onwards might be the best thing and we moved via The Strand in full circle back to Villier’s Street and the Princess of Wales, a Nicholson’s pubs just outside Embankment Tube Station. 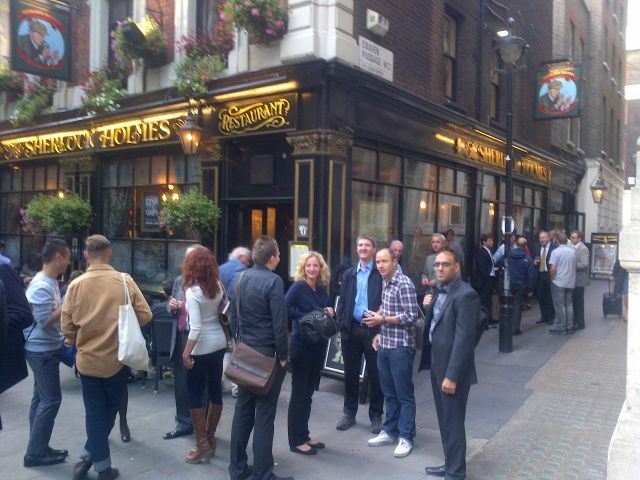 There were slight moans and groans from the collective as some of them had experienced this pub before, but to be honest I found it a regular if slightly unimaginative Nicholson’s hostelry with a good choice of beer and the Cask Marque certificate was easily available on the wall by the toilets. Then at just gone 7 o clock, just as we were deciding whether to stay for another one or not, the landlord decided that it was disco night and slammed on some blazing Jamiroquai out of every loud speaker. Why? 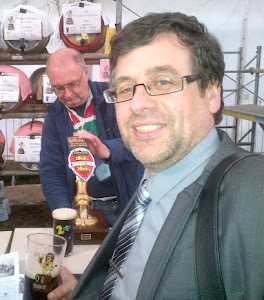 Did he peer over the handpumps and decide that the crowd looked bored and were just waiting for livening up? Or did he just do what he does no doubt every night and without consideration to his public alienate the majority of the clientele? Whatever the reasons, they were lost on us anyway; we made out escape after just one pint and crossed back over the Strand into Chandos Place and the multi-award winning Harp. 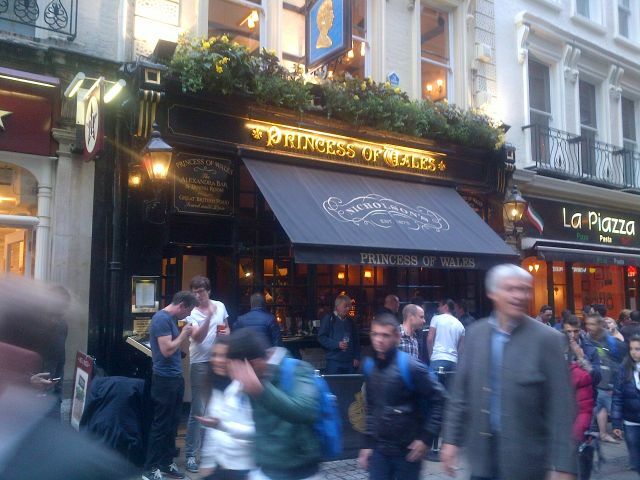 This tiny narrow pub had a multitude of patrons spilling over onto the pavement and it wasn’t until I entered that a realised how multi-award winning it was. There seemed to be CAMRA certificates all over the shop and Cask Marque certificates stretching back year upon year, but alas we couldn’t locate the current certificate and get the scan. It was then I noticed that this was not only a multi-award winning CAMRA pub; it was in fact the National Pub of the Year for 2010! Inside the Harp. 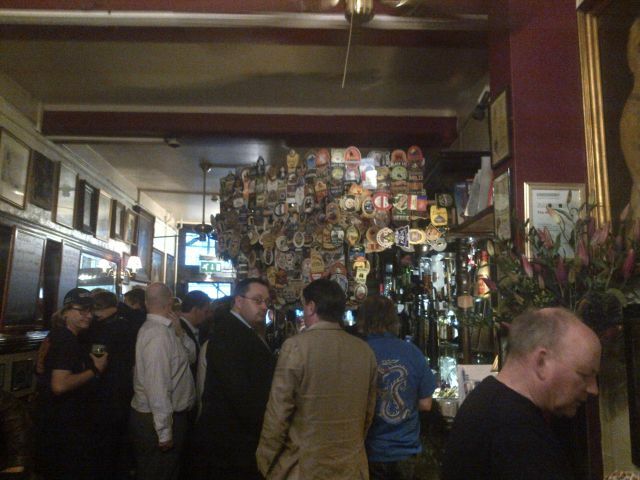 The picture doesn't show how there are as many people as there are pump clips! 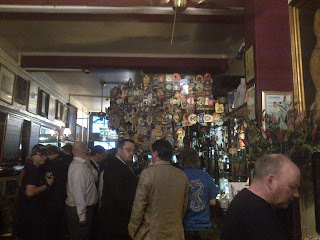 I would have loved to have spend longer there – the bar was simply covered with ex-pump clips, almost like a plastic ivy crawling up to the ceiling but not only was the pub simply too full, but even outside we were constantly hassled by a rather over zealous glass collector who insisted we stood in certain areas. I will see whether Cask Marque’s claim that if you can prove you visited a pub but didn’t get the scan they will still award the scan is true as I say attempting to go back inside to try to find the certificate was just impossible. There was one final Cask Marque pub I’d noticed just round the corner into Bedfordbury and I hope that the little Lemon Tree is tucked away where hopefully enough people do find it. It’s a lovely little oasis amongst the crowds of Covent Garden and the pint of Harvey’s Best Bitter was without doubt the best I’d had all night. So much so we stayed for three of them. It's to my shame that I forgot to take a photo of the place but they can rest assured that we spent more there that we did at the other three! The Cask Marque certificate was easily available on the wall and the most fun was trying to bet whether the various lotharios in the window seats would successfully “pull” their nominated ladies. We reckon one will, and one won’t. Not that we’ll ever find out anyway…………………….. There was definitely something funny which happened tonight which I can't remember.........there maybe an update to this post! Advice for Aussie Pete = It’s all for charity mate! I’ve remembered the funny thing, although trying to write about it may well be nigh on impossible……….but here goes. Oh, I get it; it’s my hilarious comedy midland accent again. This seems to delight co-workers as I offer to make a “kup” or a “mugg” of tea when of course it apparently should be a “caaaap” and “maaaag”. So I challenged Charlie to say polo shirt and it seems you can take the man out of Somerset but there’ll still be a bit of corn chewing yokel left behind – “Poo-loo” it seemed to come out. Then we went round the group – most seemed to go for a pretty standard southern “Paw-lowe”, although Mags took this to new levels with a sort of Wizard of Oz Wicked Witch inspired cackle (“Paow-Laow”) – but nothing prepared us for Aussie Pete. Although we were all expecting and awaiting something of a high rising terminal what we weren’t expecting the way he mangled the two vowels into two completely different sounds – they nearest I can type it is “Pouw-Laough” – Rolf would have been proud! How we laughed until the Cancer Research guy turned up! Nice to see that Fuller's are great at customer service and keen on retention! Couldn't agree more Nate - I'm going to recommend to First Great Western that they go on the Fuller's customer service course!